Momma Told Me: Dress for you! When I was young, fresh out of high school and in college, I loved all things girlie. I wouldn't let a warm Southern California day go by without sporting a Summer Dress or a flowy skirt and heels. But, as women know all too well, time is not always so kind to our curves, and sizes and shapes tend to change. My weight has fluctuated quite a bit over the past ten years, and only recently did I drop over 60lbs after a serious health scare. I never was a 'big' girl, but I've never been a 'small' girl either. I have curves, from head to toe, and this can be a difficult fashion hurdle for a 5'11" woman entering her 30s. I still want to be fun and flirty, but I also want to be modest and feminine. 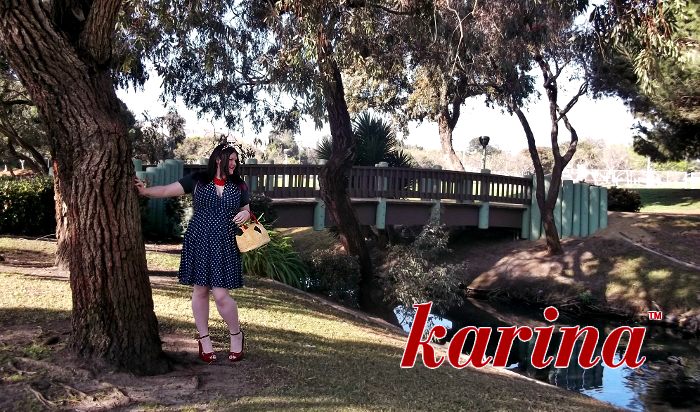 And that is how I fell in love with Karina dresses, a brand that truly makes a dress for every body. With 12 core designs, and numerous prints within each design, the Karina collection is always evolving through the season and to meet their customer's demands. Several of the styles, such as the Gala and Lauren even offer different cuts and lengths to suit the wearer's tastes.A lot of the dresses feature fabrics in beautiful bold prints that certainly make a statement, though the designs, themselves, are forgiving and simple. After having tried the Magenta Safari Gala Wrap Dress and the Penelope in Purple Plaid, I wanted to find a Karina that was a little closer to my comfort zone; something almost vintage in style. In a Navy With White Polka Dot print, this fun and flirty capped sleeve dress swings just at my knees and is ever so comfortable. Karina Dresses are made to flatter women of every size, and I certainly am a well endowed, full figure, woman. That being said, I have had my challenges with the bust on previous dresses, and this was no exception. When I first put the Nora on it nearly swallowed my chest, showing nothing but fabric up to my neck. This was great for my Aunt's 90'th birthday celebration, with the entire family gathered, but for my photo-shoot I wanted to look a little younger. For the evening, I pair the cap sleeves with a lightweight shrug that can easily be removed for dancing. 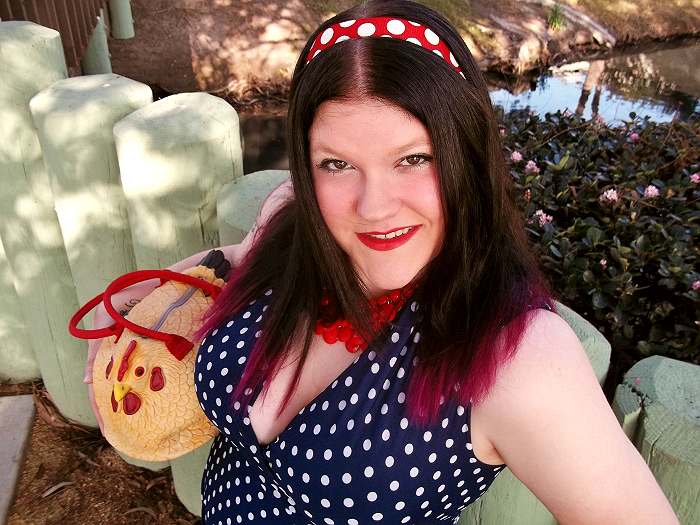 To accessorize the V-Cross front I used a chunky cherry red enamel bib necklace, my faithful Chicken Purse (for just a little extra Kitsch), some Mary Janes from Torrid and a Red Polka Dot Ribbon in my hair. The Karina collection is growing every day, and some of my favorite prints and styles are making their way out of the collection, *cough, Purple Plaid Penelope* so be sure to stop by today! In a few weeks the remainder of the Spring 2014 line will be revealed, and you'll want to be the first to see the gorgeous prints lined up! Sign up for the Karina newsletter to stay up to date on the latest style additions and prints in your favorite dress, and be the first to hear about 50% off flash sales. 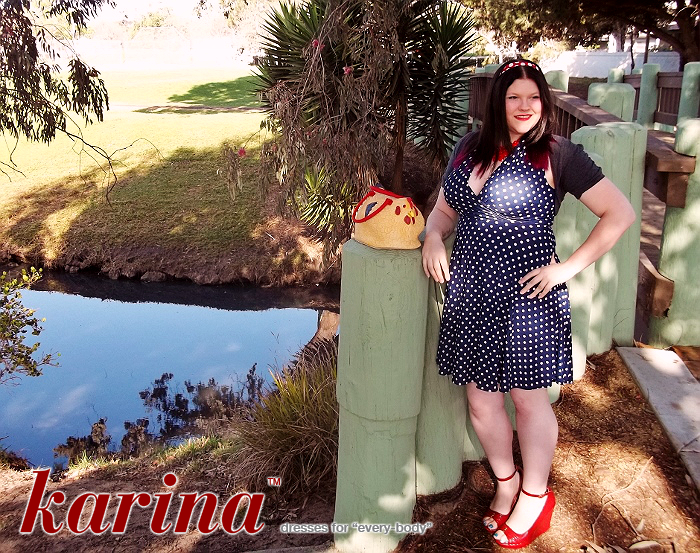 I've teamed up with 11 other fashionable bloggers to help showcase how Karina dresses truly are dresses for 'every-body'. Join us here on February 24, 2014 for your chance to win a 6 Karina dress wardrobe in the Karina Dresstacular™! 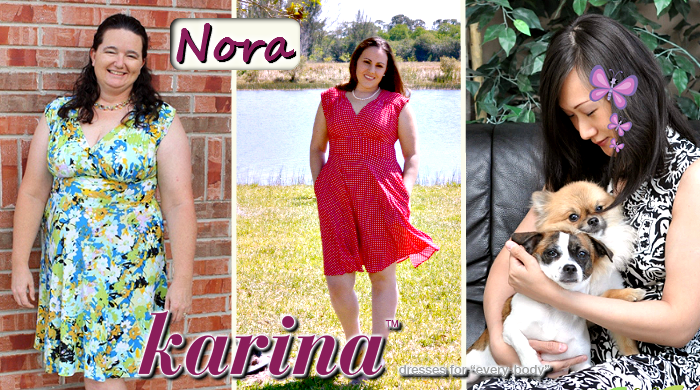 What Daughter Says: Find clothes that fit your style and shape with Karina Dresses! You look amazing! That Karina dress is super flattering on you. I also love that you are 5'11 and still rock the heels! I just love this dress on you - it does have that retro vibe that you wear oh, so well. And did I see a chicken purse? I haven't tried the Nora yet. Seeing it on you (especially in those polka dots) is definitely tempting me! I definitely gravitate towards companies that have a wide variety of clothing and accessories for woman of EVERY shape, size, age, ethnicity, etc. Being different is beautiful and it sounds like Karina Dresses GETS that! I love the Nora dress on you! I just did a review for the Ruby Dots one and want to get the navy next! I love your retro styling with that dress. 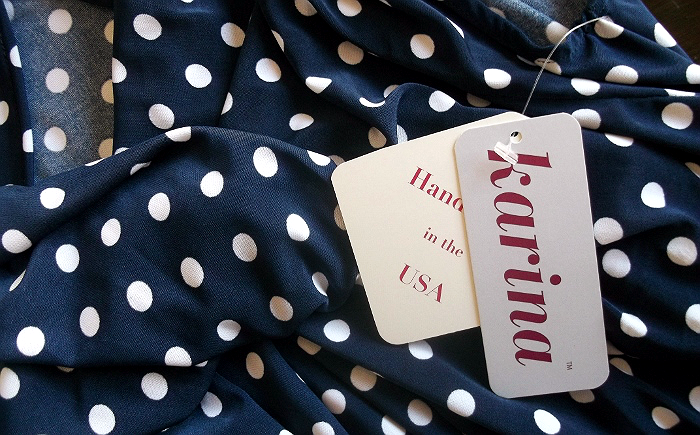 For some reason, I did not know that Karina were Made in the USA. I love supporting these companies. I have really been wanting to try Karina dresses. 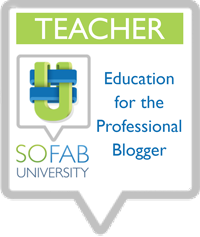 I'm a 6th grade teacher and need to wear professional and modest clothes to work each day. I LOVE wearing dresses because it makes it so easy to get ready in the morning! LOVE the polka dots. 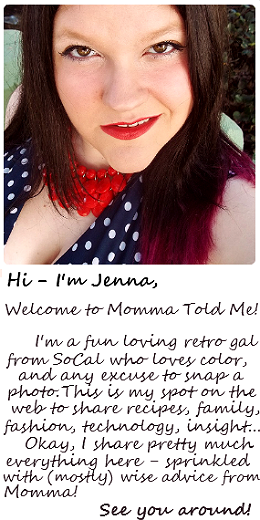 Super cute and very flattering! I love the big polka dots. This is a very nice looking dress and it has a flattering stlye to it. Looks very good on you!! 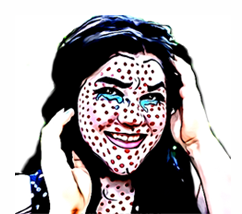 You really can pull off the polka dots,it flatters you very well. I love the dress. I love polka dot dresses. I love the colour of this dress; I think navy is such a fabulous colour that adds brightness to any wardrobe but also looks slimming, like black does. I also love that this dress has pockets in it! I Love her America's Next Top Model pose; the outfit is pure FIRE! You rock this Nora dress! So cute! I love this one with the red shoes. Such a cute dress! I have always been partial to polka dot fabric. I love the touch of red you added with your shoes. You look really nice! You look amazing!! The dress is beautiful!! That fabric looks un-wrikle-able, which I'm always hunting for because I live in a suitcase. These dresses look so cute and comfortable! And, now that summer may be coming, I WANT ONE!It nice they suggest dress styles according to your body shape. Such an amazing dress. You look beautiful in it. It is so flattering to your figure. I love that you can wear it during a hot day and stick a little jacket over it for a chilly night. You ware it so well, and look supper comfy in it. Love the dress- so flattering and it really pops with the red heels- you are ready to go out on the town! Looks wonderful! I just love polka dots I would rock the hell out of this dress. Polka Dots are my thing. They really look good on you! I gotta get me one! Valerie W said...Polka Dots are my thing. They really look good on you! I gotta get me one! Had to repost, won't post with my name unless I put it in the comments!! You really rock that dress. You look adorable with your chicken bag. You are a character! Love it! You look super cute!! I really like the dress on you!!! I love that dress and they are easy care as well. It looks so comfy! Thanks! I love the look- especially the heels!! The dress looks great and I believe it has POCKETS! Love the halter top part! Just love the Navy & White Polka Dot on you! I just love polka dots and the dress looks terrific on you. Love the red shoes too. Love the retro feel you've created - I need to get this print. Also LOVE the chicken purse with it! The navy and dot dress is adorable, and I love how you paired it with the red hairband! So cute! Very cute! I love the polka dots, and your styling is fantastic--accessory wise, I'm not sure if I like the heels or the chicken purse best! Gorgeous , and so flattering. And the chicken purse! This dress looks great on you, and that chicken purse is hilarious! You look beautiful as always. I love these dresses on you girlie. I just love the red with the blue polka dotted dress! 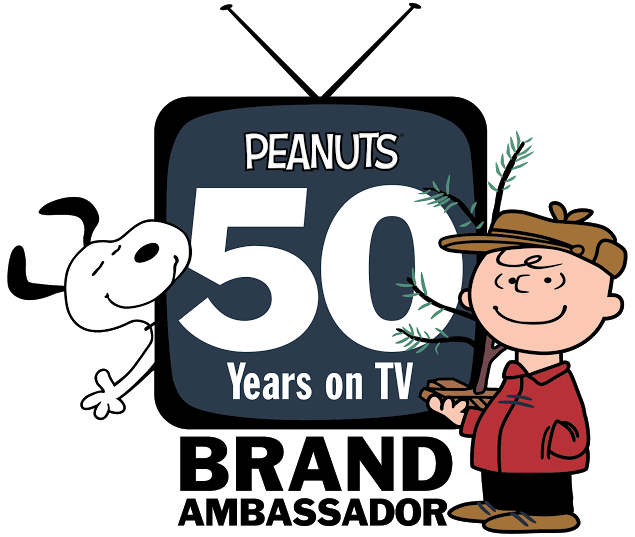 I love the 50's style you have. You look so pretty. That looks great on you! I love the size of the polka dots! Such a vintage look! So fun! I love the polka dots. It looks great with the red shoes. I love that it could be worn for a casual lunch or a fancy dinner!!!!! I love the dress, almost as much as I covet your chicken purse! These are lovely dresses with a lot of potential. I could wear these eaveryday! Love the polka dot dress!!! This is a great dress and actually looks comfortable.